Acer Aspire Switch 10 SW5-012-16GW is a 10.1 inch detachable hybrid 2 in 1 touchscreen with tough Gorilla Glass 3 notebook that can be used in four different modes (notebook, tablet, tent and display) with the easy switch provided by the magnetic Acer Snap Hinge, a quad core Intel Atom processor and 64GB Solid State Drive, up to 8 hours of battery life on a single charge for your improved productivity on the go and a 12 month subscription of Microsoft Office 365 Personal with the activation code. 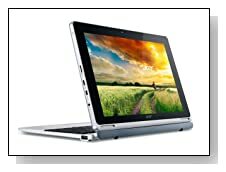 It offers the notebook capability with tablet mobility at a rather decent price. Acer Aspire Switch 10 comes with the Intel Atom Z3735F processor (2MB cache) at 1.33 GHz speed up to 1.86GHz with Intel Burst, 2GB LPDDR3 SDRAM system memory, 64GB SSD for faster performance plus BYOC- Build Your Own Cloud that enables you to arrange the storage capacity, start-ups and resuming from hibernation, Windows 8.1 operating system with Bing. 2GB is a little small for Windows 8 OS laptop but a good amount for a tablet and can not be upgraded but you will be fine performing your basic daily tasks- surfing the net, using social media, word processing etc. 64GB flash drive is quite all right at this price level and offers some storage for your files, then you have the Cloud storage anyway. 10.1 inch active matrix TFT-LCD LED-backlit high definition 5-point touchscreen that supports multi gestures with 1280 x 800 pixels maximum screen resolution, 350-nit high brightness, Zero Air Gap, IPS technology for larger viewing angles and Intel HD Graphics offer clarity, sharpness, display brightness and vivid colours with improved contrast with the LumiFlex technology. It can be used comfortably outdoors in sunlight and the touch display is optimised for Windows 8 and is quite responsive to touch. 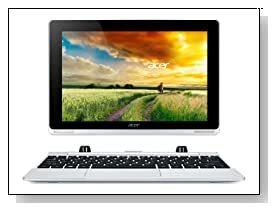 It is offered with the Acer Crystal Eye high-definition webcam with 1920 x 1080 pixel resolution with crisp image quality and built-in microphone for great video and audio in live Skype chats. The stereo speakers are located at the front and the sound quality is helped with the high definition Audio support. Don’t expect advanced gaming performance here but the screen is great for general daily multimedia purposes. Silver Acer Aspire Switch 10 is a great 2-in-1 for those with on-the-go lifestyles as it weighs just 1.29 pounds in tablet mode (2.4 lbs total- with the keyboard) and has the dimensions of 10.30 x 6.97 x 0.35 inches- only 0.35 inch thin! It has a premium feel with the metal brushed design on its back, has a proper laptop keyboard with spaced out keys for accurate typing and no numeric keypad but a nice trackpad, will fit easily in any bag and with the long- up to 8 hour battery life from its 2-cell lithium polymer battery (5910mAh). Connectivity options include the 802.11a/b/g/n Wireless LAN with Acer Nplify, Bluetooth 4.0, 1 x USB 2.0 port, 1 x Micro USB 2.0 port, 1 x Micro-HDMI with HDCP support and a Micro SD memory slot. It goes from laptop to tablet to tent to display modes easily and as it is detachable you can just remove the screen and take it with you to use as a tablet. The Gorilla Glass 3 is quite durable, strong and resistant to scratches. Conclusion: Acer Aspire Switch SW5-012-16GW is a very versatile, stylish and functional hybrid machine with the Acer Snap Hinge that offers a magnetic and latch-less design for smooth transition between different modes. It is great to have the full version Office 365 Personal- Word, Excel, PowerPoint, Outlook and OneNote free with the activation code for a year and the long 8 hour battery life for improved productivity. It is very easy to set-up and start and would be more than adequate for those that purchase PCs for using mainly the internet, word processing, playing light games, watching videos and listening to music (which covers most computer customers). It comes with the 30 day trial of McAfee pre-installed but you may be better off getting rid of it if you want better performance overall and install something like AVG free version. Sure it is not the best, the most impressive and the most powerful laptop on the market but sure is a great modern machine that offers good value for dollar.